Texas-Israel Chamber of Commerce Board Member and Dinner Co-Chair Yoram Solomon, a senior director in the CTO Office of Texas Instruments’ Wireless Terminals Business Unit, Semiconductor Group, introduced Mr. Frantz, who is responsible for finding new opportunities and creating new businesses utilizing TI’s digital signal processing technology. Frantz has been with Texas Instruments for over 30 years, most of it in digital signal processing. He is a recognized leader in DSP technology both within TI and throughout the industry. He is a fellow of the Institute of Electrical and Electronics Engineers and holds more than 40 patents in the area of memories, speech, consumer products and DSP. Frantz also has written more than 50 papers and articles and makes presentations at universities and conferences worldwide. He is widely quoted in the media due to his tremendous knowledge and visionary view of DSP solutions. Jerry White, director of the Caruth Institute for Entrepreneurship at SMU, introduced Mr. Litman — a serial entrepreneur. Litman has spent the last 25 years founding, building and growing companies, including Travel Mart, hotels.com and Consumer Club. He also runs Wildflower Investments, a conservative investment company. He has taught an MBA course on “Conservative Entrepreneurship” at the Cox School of Business at SMU, and he lectures to universities and business groups on how to be a conservative entrepreneur. Other guest speakers were Chamber Ex-Officio Board Members Asher Yarden, consul general of Israel to the Southwest and Mark Ellison, director of the Texas Emerging Technology Fund, Office of the Governor. Special awards were also given to the following people for their contributions to the Chamber: Jeffrey Koch, portfolio manager, Office of Management and Budget, The White House; Tamar Guy, executive director, Israel-America Chamber of Commerce; and Rivka Arad, director of Lifelong Learning, Temple Shalom. Approximately 170 guests attended the Awards Dinner Gala, which was underwritten by Continental Airlines. The dinner concluded with two raffle drawings each for two international roundtrip tickets courtesy of Continental Airlines. Chamber Board Member Andy Lavigne, senior VP of Gulf Coast Credit, was the winner of the first drawing. Waldman Bros. Insurance won the second drawing; Chamber Board Member and Awards Dinner Co-Chair Martin Golman, a partner at Waldman Bros. Insurance, accepted the flight vouchers on behalf of his company. 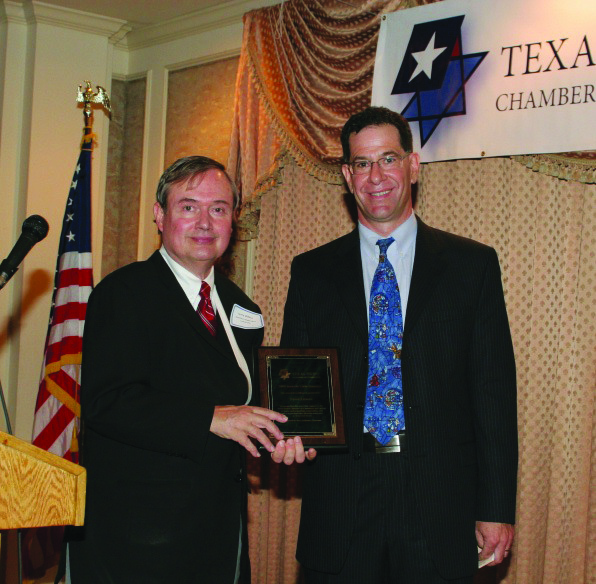 For more information on the Texas-Israel Chamber of Commerce, please visit www.texasisrael.org and call Russell Levine, president and CEO, at 214-576-9639.